Chronic pain is widely prevalent among Veterans and can have serious negative consequences for functional status and quality of life among other domains. The Veterans Health Administration (VHA) convened a state-of-the-art (SOTA) conference to develop research priorities for advancing the science and clinical practice of non-pharmacological management of chronic musculoskeletal pain. In this perspective article, we present the methods and consensus recommendations for research priorities emanating from the SOTA. In the months leading up to the SOTA, a core group of researchers defined four areas of focus: psychological/behavioral therapies; exercise/movement therapies; manual therapies; and models for delivering multi-modal pain care and divided into workgroups. Each workgroup, in their respective areas of focus, identified seminal studies capturing the state of the evidence. Herein, we present consensus recommendations ranging from efficacy to effectiveness to implementation/dissemination research depending on the state of the evidence as assessed by participants, including commentary on common elements across workgroups and future areas of innovation in study design, measurement, and outcome ascertainment. A summary of the SOTA was presented as a VA HSR&D Spotlight on Pain Management Webinar in March, 2017. 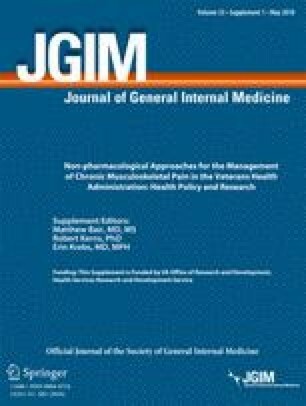 Chronic pain is widely prevalent among Veterans and can have serious negative consequences for an individual’s functional status and quality of life.1 Furthermore, a primary treatment modality of the last two decades—long-term opioid therapy—has limited effectiveness and potential for serious harm.2 Accordingly, the Centers for Disease Control and Prevention and other stakeholders have promulgated recommendations seeking to shift healthcare systems away from opioid-centric chronic pain management and towards multi-modal treatment paradigms where evidenced-based non-pharmacologic treatments are promoted.3,4 To this end, the Veterans Health Administration (VHA) convened a state-of-the-art (SOTA) conference to develop research priorities for advancing the science and clinical practice of non-pharmacological management of chronic musculoskeletal pain. Here we present the methods and consensus recommendations for research priorities emanating from the SOTA. In the 6-month period leading up to the SOTA, co-chairs recruited a core group of researchers comprising the SOTA planning committee. Through a series of teleconferences, the committee reached consensus on four areas of focus—psychological/behavioral therapies; exercise/movement therapies; manual therapies; and models for delivering multi-modal pain care, divided into four workgroups, and refined key questions to address SOTA objectives. Each workgroup convened a series of teleconferences to further refine key questions, identify subject matter experts (an expanded group of clinicians, researchers, and policymakers) to participate in the SOTA, and select pre-conference readings the larger group of SOTA participants were assigned. The entire planning committee met periodically to discuss the progress of each workgroup. Pre-conference readings were chosen by workgroup consensus, prioritizing recency of publication; high-impact, high-quality individual studies or systematic reviews (if available); and that, taken together, each workgroup’s core set of 6–10 recommended readings would promote a shared understanding of the state of the evidence among SOTA participants. Formal literature searches were not performed but each workgroup consisted of expert researchers in that area. SOTA attendees were assigned to one of the four workgroups and sent the pre-conference readings along with a list of key questions to help prepare for their workgroup discussion. At the SOTA, participants were first briefed on the overall objectives followed by workgroup leaders facilitating break-out group discussion to address key questions and to reach consensus on research, clinical, and policy priorities. Next, the workgroups developed summaries of their deliberations. On the second day, these summaries were presented to all SOTA participants, providing opportunity for clarifying questions and discussion. Finally, there was an expert panel response to workgroup summaries followed by further full group discussion. Below we present the findings of each workgroup with respect to research gaps and priorities as well as our post hoc assessment of cross-cutting research priorities. The workgroup identified several additional knowledge gaps and areas for future research. Given that Veterans with chronic pain frequently present with comorbid mental health conditions that may interfere with treatment response,14 integrated treatments (e.g., for pain and depression) may be less burdensome and more effective for patients with comorbid conditions. Because alternate treatment modalities (telehealth vs. in-person, group vs. individual, and brief vs. standard) may make interventions more accessible to patients, research on the impact of treatment delivery mode is a priority. Finally, treatments often consist of a single modality; however, there may be additive benefit to treatment approaches that combine modalities (e.g., psychological and exercise) relative to single modality approaches. This workgroup reviewed the evidence for a broad array of program types, with an emphasis on interventions that could be delivered or facilitated by providers (i.e., physical therapists) and other individuals within the VHA. The workgroup found there is sufficient evidence to recommend deployment of three types of exercise within the VHA: Tai Chi,15, 16, 17 yoga,18, 19, 20 and exercise therapies including coordination/stabilization, strengthening/resistance, and aerobic/cardiorespiratory activities.17, 21, 22, 23, 24, 25 The workgroup concluded that further study is needed regarding the effectiveness of aquatic exercise for low back pain and fibromyalgia, although evidence may be sufficient to recommend it for osteoarthritis pain.26 There is also some evidence for balance and proprioception exercises for patients with osteoarthritis. The workgroup identified evidence gaps related to implementation of evidence-based exercise/movement-based therapies that should be considered in the design of future studies including lack of standards for training and background of personnel delivering programs, lack of available standardized protocols to facilitate fidelity for some types of interventions, and sparse data comparing the effectiveness of delivery modalities (e.g., group, individual, telehealth). Several cross-cutting issues in need of further investigation across numerous types of exercise were identified that closely mirrored other groups’ findings; as such, they will be discussed in the “cross-cutting research” section below. Lastly, the workgroup recognized that access to evidence-based exercise/movement therapies is often limited; thus, future research should evaluate strategies to improve availability and reach of these programs. Though a variety of manual therapies are now well-established in the treatment of painful conditions, this workgroup identified several remaining challenges to studying manual therapies among individuals with chronic pain. These include the need to address heterogeneous pain; heterogeneity in delivery of manual therapies (e.g., variation in treatment techniques, dosing, and multimodal approaches); and identifying suitable sham comparators. Nevertheless, given the established effectiveness and favorable safety profiles, the workgroup cited a need for implementation research to enhance uptake of and accessibility to manipulation and acupuncture. Specifically, there is sufficient evidence to recommend dissemination of manipulation for low back pain (LBP) and neck pain; acupuncture for LBP, neck pain, mild to moderate knee osteoarthritis, and migraine and tension-type headache; and massage for LBP and neck pain. The workgroup identified several other research priorities. Condition-based research priorities for manipulation should include determining specific effectiveness for radiculopathy, cervicogenic headache, thoracic spine pain, and extremity conditions; for acupuncture: effectiveness for advanced knee osteoarthritis, cervicogenic headache, and extremity conditions; and for massage: effectiveness for fibromyalgia, mild to moderate knee osteoarthritis, and tension-type headache. Across all manual therapies, there is a need for research on populations not typically well-represented in clinical trials to date such as older adults, as well as those with postoperative spine pain, severe osteoarthritis, current opioid use, and complex comorbidities. Several cross-cutting research priorities related to treatment planning were identified for all manual therapies; these are discussed below in the cross-cutting research section. This workgroup identified two care model paradigms for which there is evidence for efficacy/effectiveness: collaborative care, where a care manager (e.g., nurse or pharmacist) teams with a physician to provide consultative, multi-modal pain care27,28, and stepped care, in which a care manager, following a defined algorithm, guides patients through a sequence of multi-modal treatments.29 However, the strength of evidence for these models is generally low. Thus, the workgroup recommended developing further evidence to address shortcomings of previous studies. Specifically, there is a need to better characterize patients’ pain duration, opioid use, and prevalence of comorbidities and co-interventions received. There is also a need for more rigorous evaluations of model fidelity, assessment of a broader range of clinically relevant core outcomes,30 longer term follow-up, and inclusion of underserved populations such as rural Veterans and racial/ethnic minorities. The workgroup observed that effective models are not reaching sufficient numbers of patients in part due to the lack of evidenced-based implementation strategies. Real-world dissemination challenges include the limited availability of care managers trained in pain management; the lack of cost effectiveness data; the fragmented nature of pain care services even in integrated systems; patient complexity complicating treatment decisions; lack of provider training in algorithm-guided pain treatment; and variability in patient education, activation, and expectations. Novel models of care delivery need formal efficacy/effectiveness studies, including peer-delivered or informal care-giver interventions, pharmacist-led pharmacological treatment optimization, group-delivered interventions, telecare-delivered interventions, and prognostic screening or risk stratification to tailor interventions. Other key issues for future effectiveness research included the following: how to optimize treatment effects in terms of matching resources to patient needs; the effect of tailoring interventions based on patient complexity; and exploring sequencing vs. combining intervention effects. Across all work groups, common themes emerged about the need for further research involving tailoring therapies to patient preference, especially in light of roughly equivalent effect sizes across modalities; combining or sequencing therapies and/or treatment components; evaluating the optimal dose and modality for treatment delivery (e.g., telehealth vs. in-person sessions, individual vs. group, brief vs. standard length therapies); demographic and clinical characteristics predicting response to treatment; and optimizing duration of effect; as well as determining optimal approaches for those with comorbid mental health or complex medical conditions. Yet, conducting standard randomized clinical trials to evaluate these various treatment features among patients with a range of clinical characteristics may not be feasible. Workgroups discussed innovative trial designs31 that allow rigorous, systematic ways of testing a combination of approaches within a single trial including the multiphase optimization strategy and the sequential multiple assignment randomized trial.32,33 These methods are designed to optimize intervention components with regard to dose and sequencing and to test which intervention components can be used alone or in combination. These types of study designs could also efficiently advance our relatively limited understanding of patient characteristics that predict response to different treatments. Further, in the context of recognition of the weaknesses and limitations of pharmacologic trials and the failed clinical paradigms emanating from them, there have been increasing calls to consider a broader range of potentially important patient- and system-level outcomes associated with pain treatments, including prioritizing improvements of pain-related functioning and quality of life (rather than a primary focus on reducing pain intensity), earlier and more systematic inclusion of adverse events, and consideration of costs and cost-effectiveness for individuals healthcare systems. Systematic consideration of such outcomes may highlight the relative benefits of the types of behavioral approaches described in this review. There is widespread consensus that chronic pain management should feature non-pharmacologic treatments that foster patient self-management and biopsychosocial wellness. However, to bring this vision to reality, more evidence-establishing research is needed. Based on the findings of a two-day VHA SOTA conference, we have outlined a research agenda related to four areas of focus. Within each area, we identified research gaps based on our assessment of the current state of the science that may be helpful in guiding future studies. The authors wish to acknowledge the SOTA co-chairs and planning committee members who were not involved in writing the manuscript but whose process and products are described herein: Robert D. Kerns, PhD; Erin E. Krebs, MD, MPH; Benjamin Kligler, MD, MPH; Jennifer Murphy, PhD; Stephen Ezeji-Okoye, MD; Daniel Cherkin, PhD; Rollin “Mac” Gallagher, MD, MPH; and Matthew J. Bair, MD, MS. The Department of Veterans Affairs, Health Services Research and Development provided funds for the SOTA described in this manuscript. Drs. Becker and Heapy receive funding from VA HSR&D/QUERI project 15-460. Dr. Makris was supported by the Center for Translational Medicine, NIH/NCATS Grants (KL2TR001103 and UL1TR001105), and she is currently supported by a VA HSR&D Career Development award (IK2HX001916). Dr. Krein is supported by a HSR&D Research Career Scientist Award (RCS 11-222). Dr. Allen is supported by the Center for Health Services Research in Primary Care at the Durham VA Healthcare System (CIN 13-410) and a National Institute of Arthritis and Musculoskeletal and Skin Diseases Multidisciplinary Clinical Research Center P60 AR062760. Drs. Heapy and Higgins received consulting fees from Magellan Health for the development of a web-based CBT program for chronic pain. All other authors declare no conflicts of interest. The Opioid Therapy for Chronic Pain Work Group. VA/DoD CLINICAL PRACTICE GUIDELINE FOR OPIOID THERAPY FOR CHRONIC PAIN. 2017; http://www.healthquality.va.gov/guidelines/Pain/cot/. Accessed May 16, 2017.